This course will guide students through an introduction into the odot (o.) programming toolkit for Max/MSP. ODOT helps the Max programmer in gaining more finite control over the ways in which you are sending data between applications in a network. Participants will construct sophisticated patches with an emphasis on interaction and exploration, while learning strategies and patterns for managing complexity, debugging, testing, and robustness. The course is tailored to artists and developers working with time-based media. odot provides a container, the "odot bundle", an extension of Open Sound Control (OSC), for naming, aggregating, and structuring data. In the Max programming environment, this is supported by a number of externals and patches for creating, manipulating, and displaying these structures. Leveraging this toolkit, we will explore the design of complex, real-world patches, with an emphasis on real-time processing. In addition to the suite of externals, odot provides an expression language which supports a wide variety of programming paradigms, including functional, declarative, imperative, dynamic, delegation-based, dynamic class-based, and aspect-oriented. The class will also prepare students in continuing studies outside of the course, using the upcoming CNMAT Music and Computing Max package. This package contains further training in odot, alongside a wealth of useful Max and Gen~ tools, best practices, and workspace applications. 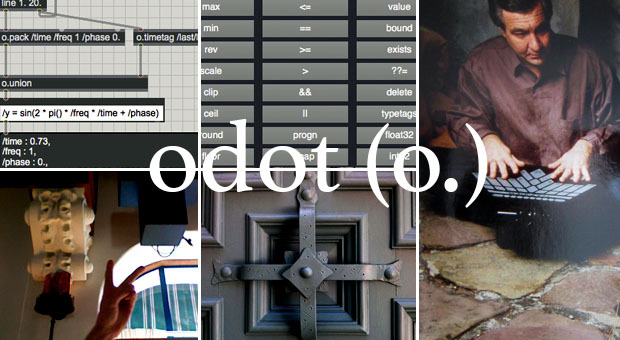 odot was developed by John MacCallum, Adrian Freed, Ilya Rostovtsev and Rama Gottfried at CNMAT. John MacCallum will be present for a special presentation and performance at the end of the workshop. Prerequisite knowledge: Basic Max/MSP. Other programming knowledge may help, including experience with LISP, although not necessary.